Brimming with top stylemakers' and designers' innovative floral design ideas to enliven the home, Living Floral will resonate with those who appreciate the beauty and everyday luxury of flowers. For this inspirational, yet instructive, book Shaw presents portraits of top tastemakers at home who share their joy of flowers. From interior designers Charlotte Moss, Suzanne Rheinstein, and Bunny Williams, and event designer Tara Guerard to floral and garden experts Sybil Sylvester and P. Allen Smith and culinary consultant Alex Hitz, these luminaries impart their personal botanical point of view. They show how to incorporate flowers in home decor and present numerous ways to entertain with flair. Interior designers illustrate how eclectic furnishings work well with floral and botanical accents in fabric, wallpaper, artwork, and accessories to shape chic indoor spaces. We will learn how traditionalists and modernists put together an attractive table; for example, by mixing heirloom silver with simple white china and bright flowers arranged in everyday glass containers. 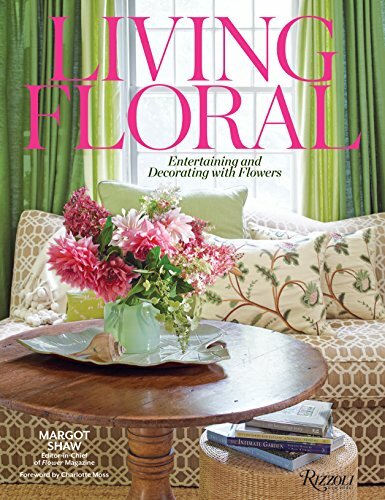 This gorgeously photographed book concludes with a primer on such topics as extending the life of fresh-cut flowers and assembling a table runner of charming blooms. Living Floral is a must-have for flower and interior design enthusiasts, as well as home gardeners.